If you're wondering whether Guake and Yakuake are Polynesian happy mushrooms, you're a bit off mark. These are Linux command line terminals, modified to behave like the console in the popular First Person Shooter (FPS) Quake. Hence, the funny names. Both Guake and Yakuake are more than just gimmicks. They are useful utilities that can significantly boost your productivity. Working with the command line, especially on modern desktops, usually requires using the mouse cursor to locate the terminal icon shortcut or find it buried in one of the menus, losing focus and wasting time. Guake and Yakuake, following the Quake-like behavior, are smarter. You can have the terminal without moving your "crosshairs off the target." Just like the gamers can't afford to move their mouse about looking for a menu. Guake and Yakuake use hotkeys and show up as semi-transparent drop-down consoles. They automatically grab focus when activated and let go when closed, allowing to you to shuffle into the command line in seconds, do what you need, and get back to doing the desktop stuff. 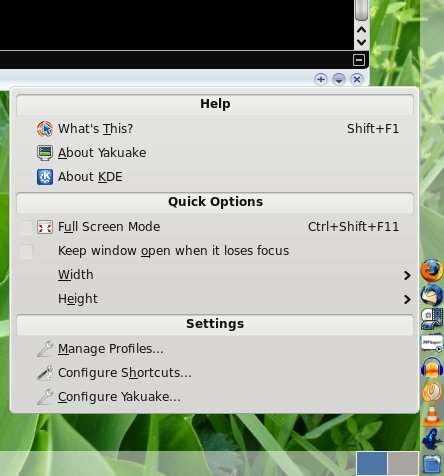 Guake is a Gnome utility, but that does not mean you can't use it on other desktops, as long as you have all the supported libraries. Furthermore, you're likely to find it in just about any new popular distro repositories, making the installation a quick and painless affair. For instance, on Debian-based distros with apt-get, you can have it installed in the matter of seconds by typing: sudo apt-get install guake. Firing up Guake, you'll get a small popup message, informing you of the hotkey. Press once and Guake will drop down. Press again and it will roll up. Just like in Doom or OpenArena or any decent FPS. You can tweak the Guake behavior. Guake will have an icon in the system area on one of the panel. Right-click to access the properties and change them to suit your whims. 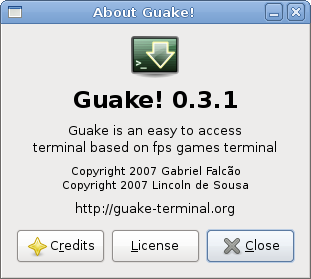 Guake is a cool little tool. 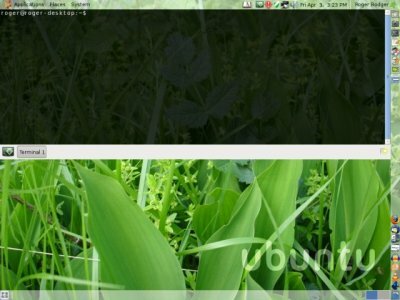 It's an excellent addition to any Linux user, even beginners, although they might not rush to use the command line. For power users, it's a pleasant must. 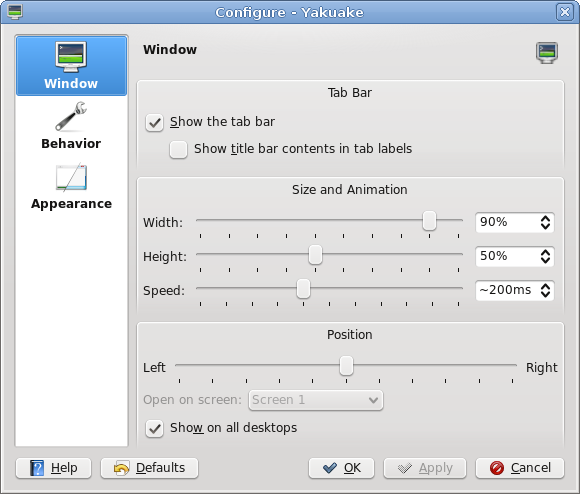 Yakuake hides its options/preference menu in the little down arrow in the right bottom corner of its window. 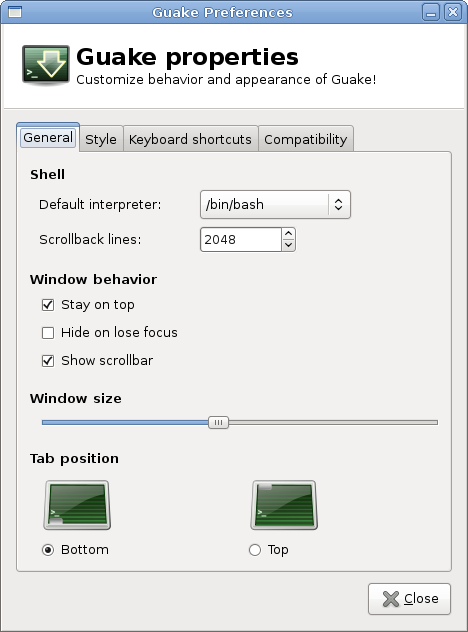 Like all KDE applications, it boasts an impressive array of options and sub-menus. Guake, on the other hand, keeps it Gnome-style minimalistic and simple. Well, another useful thing is embedding the terminal into the desktop. There are many ways of doing it, including a small utility called devilspie or a few hacks with Compiz, provided you have the right graphic card and the necessary drivers. We'll talk about these separately. I intend to show you the third, simplest way of all. No need for Compiz or creating configuration files for devilspie. You need gOS Linux. It may not be your most immediate choice, but it is fresh, good looking, modern, and web-oriented, it should work with your web camera, and it has quite a few tricks up its sleeves. Another great way of having your terminal right there, without switching desktop spaces or windows. However, it is less effective than Guake or Yakuake when it comes to speed. 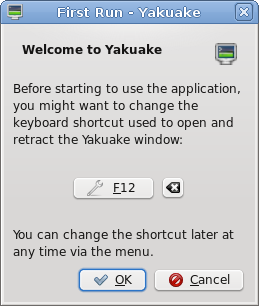 With Guake and Yakuake, you will enjoy a very fast desktop experience, with few interruptions. As you begin using the two drop-down consoles, you'll begin to appreciate the fact you need not let go off the keyboard or move your eyes about as you send the mouse cursor prowling across the desktop. Guake and Yakuake are good-looking and fun - and most importantly - they will help you increase your productivity. So start using them, today. Happy Linuxing.